The free stroke movement begins on, or just above the string. It moves through the string, pushing it towards the face of the guitar, then follows through the air, towards the palm of the hand. For beginners, it is often useful to start with the finger on the string before it is sounded. This is know as right hand preparation, and in the early stages it helps with accuracy and control. Preparing the finger on the string will make it stop ringing, which will produce a staccatto effect. Over time as you develop accuracy and control, you can reduce the amount of preparation time to let the strings ring on between each note. The finger needs to push the string downwards, into the sound board. This is not a very deep depression but you are readying the string to vibrate towards and away from the soundboard. The release of the finger needs to be quick to make a clean sound and the string will travel across the nail. Your nail shape and texture is going to come into play here. The finger will travel into the palm, towards the elbow, moving from the first joint and remaining flexible towards the tip. The resetting of the finger is a reflex motion. As your fingers naturally sit in a curved position, you need to let the travel back there on their own. 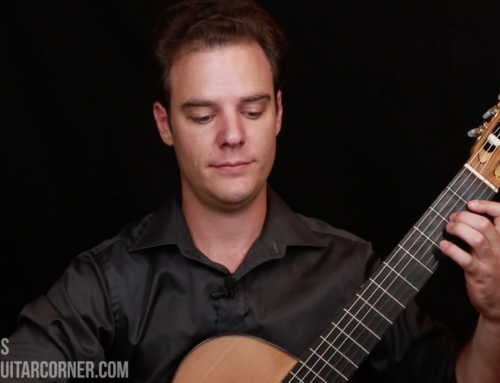 You can practice this movement away from the guitar with your hand out in front. This series of four movements needs to become one fluid motion and over time the amount of preparation can be reduced to create a more legato sound. The movement of the free stroke is entirely based in the finger. It moves predominantly from the large knuckle with the other joints remaining relatively rigid. The hand should not move in this process, but beginners will often ‘bounce’ their hand up and down as they make each finger movement. Keep the hand relaxed and still. The quality of the sounds you make has a lot to do with the direction of the finger across the string. We often talk about plucking when it comes to the guitar, but unfortunately that conjures up an idea of pulling the string away from the soundboard and then letting it slap back down. This will create a thin sound, and you might find it also catches your nail. Instead, move the finger towards your palm and elbow, start of the left side of the nail and travel across the surface of nail and push the string slightly into the guitar. The shape and surface of your nail is crucial to making a good sound. We all have different hands, fingers, and nails so there is no definitive answer to what the best shape is. It is simply going to take some time and thoughtful experimentation. However, making sure the surface (edge of the nail that touches the string) is smooth and polished will allow your nail to travel smoothly across the string and give you a clean sound. The free stroke and nail shaping are both covered in-depth as part of the Level 1 Technique & Musicianship Video Course in our membership packages!